"John7:37-38.ON the last day,that great day of the feast, Jesus stood and cried out saying,if anyone thirst,let him come to Me and drink.HE who believes in Me as the Scripture has said,out of his heart will flow rivers of living water." ",,my yoke is light,, thru the help of God,, amen,, <3 ,,"
"1 Peter 5:7....says cast all your cares on Him, 4 He cares 4 you...PTL!!! :-)"
"JESUS CHRIST is so great praise the lord"
"THOSE THAT ARE WEARY AND TIRED LAY YOUR BURDENS AT THE FEET OF THE LORD JESUS CHRIST AND ACCEPT HIM AS YOUR SAVIOR AND JESUS CHRIST WILL CARRY YOUR BURDENS FOR YOU! IF YOU CONFESS THE LORD JESUS CHRIST AS YOUR SAVIOR WITH YOUR MOUTH YOU WILL BE SAVED (ROMANS 10:9)! YOU CAN DO THIS RIGHT NOW, EVEN WHERE YOU ARE RIGHT NOW, ANY WHERE! THIS IS THE LOVE JESUS CHRIST HAS FOR YOU! SALVATION! IN THE NAME OF THE LORD AND SAVIOR, JESUS CHRIST! AMEN!" "Fix it on me Lord!" "I love to do things God's way. It's so much higher than ours. Thank you Lord Jesus, the Rock on which I stand." "Teach me 2 say yes 2 any work tat can please u lord." "Thank u Jesus this scripture came to me last nite now reading this today a sure sign :)) thank u Jesus"
"Thank You, Heavenly Father...I will be forever GRATEFUL for ALL you have done for me and my Family!!!!!!!" "Yes it is Lord........thank you!!" "You got me in the mood!!!!!!!!!!!! Singing n praising his name!!!!!!!!!!!!" "~ 1 John 5:3 ~ For this is the love of God, that we keep his commandments: and his commandments are not grievous. (KJB)"
"AMEN!! THANK YOU LORD!!! SUCH MERCY! UNDESERVED, BUT LOVED ANYWAY!!!!" "Amen, Thank You Jesus <3"
"�s vezes tenho a impress�o de que o fardo � pesado de mais, mas ao olhar para os lados vejo algu�m arcado com tanto peso e me dou conta de que o fardo � leve. Thank you Jesus." "Because you give us freedom........"
"De scripture that makes me 2 b stronger when I come across with difficulties in my lyf.thnk u jesus ur my refuge." "Easy on me ma lord"
"God's way is always different from men's way and thought towards us are of good n not evil"
"He says come and learn of me for i,m meek and lonely." "His word says anyone that come to him will not be put to shame !!!" "Im enlighted im in a critical situation"
"King James version is a 1611"
"Praise to the Lord,He always lightens our ways"
"Teresa Strauss Kaiser. Thinking of you & your Mom." "Thank God for the JESUS"
"The yoke is the holy spirit." "We are so blessed. But most people never take advantage of His Love." 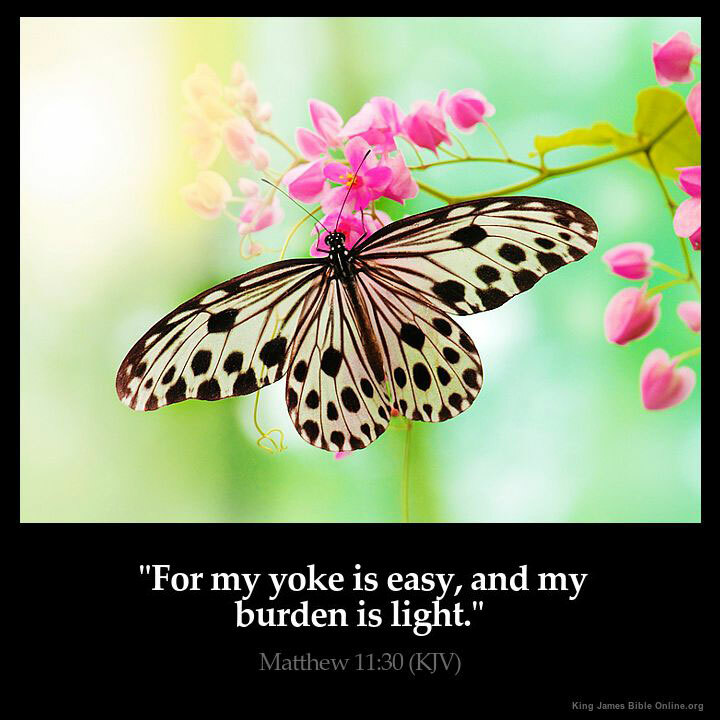 "Yes,for the LORD carry all out burden,if we obey his commanments......"
"Yoke? What is someone's yoke?" What Do You Think of Matthew 11?